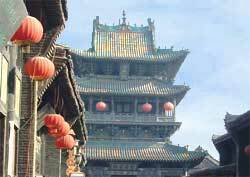 Pingyao has one of the best preserved old towns in China. Exploring its buildings, streets and city wall takes you back in time. The old city is enclosed by an ancient defensive wall 12 meters (40 feet) high and over 6 kilometers (miles) long. It dates back to the 14th century. Considering its age, the wall is in good condition (though a small section collapsed as recently as October 2004). Within the walls are narrow cobblestone streets, lanes and alleys. South Street is the main thoroughfare and is now lined on both sides with quaint shops, museums and hotels. The preserved mansions, both residential and commercial, have courtyards and are hidden from public view behind street doors. However, some are now open to the public. The most fascinating is the 19th century Ri Sheng Chang mansion. It is now a museum, but was once the headquarters of one of China's most powerful banks.